New Orleans The Lower 9th Ward became iconic as part of the story of catastrophe, struggle, and recovery in New Orleans and around the world after Hurricane Katrina. Now there are new candidates in more cities where climate and nature have combined to expose humanity at its rawest, weakest, and sometimes best. 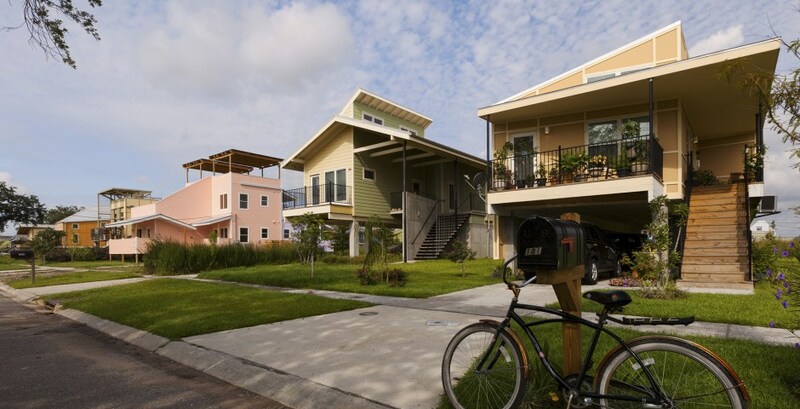 Here, the L9 is in the news again, still in the shadows of Katrina, over issues with one of the most widely publicized of the rehabilitation projects, Brad Pitt’s Make it Right Foundation. Pitt and his wife at the time, Angelina Jolie, had stepped up in the wake of the storm to use their star power to raise money to build new houses there after the storm. For a while they had a house in the French Quarter and were seen here and there. Pitt, an architectural aficionado, had commissioned famous architects, here and abroad, to design the homes, and more than one-hundred have been built. In my book, The Battle for the Ninth Ward: ACORN, the Rebuilding of New Orleans, and the Lessons of Disaster, I have some issues with Make It Right based largely on planting high-priced, subsidized houses in the L9, designed more as showpieces than structures that fit in with the vernacular of the area or were sustainable. Nonetheless, I never questioned Pitt’s sincerity and in fact when pushed by ACORN, including our organizer Tanya Harris and ACORN leaders to do the project in the real heart of the L9, rather than the rapidly gentrifying Holy Cross area near the Mississippi River, he quickly agreed and lived up to his word. Harris in recent years has worked for the Make It Right Foundation, which also says good things about it. In recent days some Foundation homeowners sued the operation because of shoddy construction, water leaks, system failures, black mold, and an array of issues. One of the local papers, the New Orleans Advocate, did an editorial recently calling on Pitt to Make It Right. Now the Make It Right Foundation has sued the architect, John C. Williams, for $20 million for design flaws that caused these problems, alleging that Williams and his firm have known about the problems and failed to correct them. Maybe there will be a trial, but likely they’ll settle, which might work for the homeowners, but will leave the citizens less informed than they might need to be about John Williams and his practice. Based on our experience with Williams, I’m siding with Pitt and the foundation on this one. Vanessa Gueringer, long time ACORN leader in the L9, chaired an event a local church there to discuss my book when it came out several years after Katrina. John Williams showed up for a hot minute. Shook a few hands and bought a book to see if his name was in it. He got his money worth. He was mentioned in the book. I doubt that he liked what was said about him there any more than he is going to like having to defend his work in the Lower 9th Ward now that the houses he built are already crumbling around him. Greenville In New Zealand we were asked, “How is New Orleans?” In California, whether Santa Rosa or Sonoma, the question arose, “How is New Orleans?” Thirteen years have passed since Hurricane Katrina swept through the city, and the question is still important, “How is New Orleans?” The answer: better than it was, but not as good as it needs to be. That’s not a whine, just a statement of fact. Another new Mayor is now in charge, our first woman, an African-American again, and our first non-native born in a long, long time. There’s hope mixed with thirteen years of cynicism. Too many plans have been made without enough progress. The big local television station reached out for ACORN’s affiliate, A Community Voice, so that they could dig deep into the lingering impacts felt by one of their leaders, Gwen Adams. They wanted to tell the story through a personal lens, but her organizational t-shirt cries out about how political this is. Gwen lives within a spit of the levee in the lower 9th ward. She was a union teacher in the New Orleans Public School System. 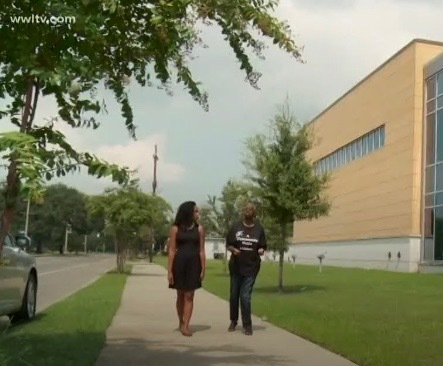 She was fired like thousands of others, and despite the fact that she was a former Teacher-of-the-Year in Orleans Parish, she was never offered a return to work. She was also unwilling to go to work at lower pay, forfeited retirement and other benefits, and no job security or protection for a charter operator. She is now a sometimes substitute teacher. She is a great ACORN and ACV leader. These are the facts. The facts are also being reckoned with in Puerto Rico almost a year after the island was slammed by Hurricane Maria. The governor there actually apologized, which is a refreshing surprise. He also announced that the death total is now estimated at near 3000 people compared to the earlier estimates that were hardly one-hundred. In the same report, the news story mentioned that the death total from Katrina is still not known absolutely. The governor noted that they had no disaster plan that assumed no power, no highway access, and no communication. George Washington University in the District of Columbia has been doing a study for them, but it is hard to believe there will be any surprises. A spokesperson for the Milken Institute argued that the lesson of Puerto Rico is “focus as much as possible on lower-income areas, on people who are older, who are more vulnerable.” A survey from Kaiser Health Foundation and others in Texas in the wake of Harvey found that the same populations were still suffering there. We all thought that was also the lesson learned from Katrina thirteen years ago. When are we going to be willing to really act on the lessons we keep being taught after disasters? No one seems to know – or act on – the lessons we keep being forced to learn at the price of suffering and death.